Have fun and change the world by supervising pharmacy students who are conducting health screenings for medically underserved populations. 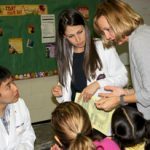 Project Collaborate is coordinated and conducted by UT College of Pharmacy students who conduct screenings and provide patient counseling at various locations in Austin, San Antonio, El Paso, and the Rio Grande Valley. 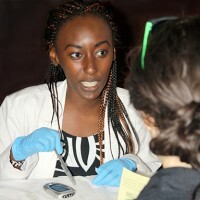 Students provide free health screenings for blood glucose, blood pressure, total cholesterol, body mass index, weight, and body fat percentages. They also set-up free educational booths to present information on a variety of disease states and health care topics. 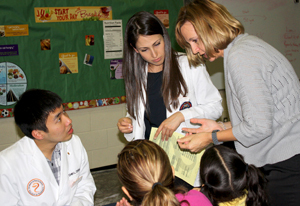 Students provide the screenings and educational programs under supervision of a licensed pharmacist preceptor. Project Collaborate has expanded every year since its inception in 2009. During the 2011-2012 year, 1,600 patients were screened in Texas; during 2012-2013, 2,109 patients were screened. Community recognition for the value of Project Collaborate events has grown and with this recognition comes increased demand for more screening events. We need the support and guidance of our alumni and friends who are practicing pharmacists to ensure the continued success and expansion of this incredible program. Why are alumni volunteers needed for Project Collaborate? Since they are conducting screenings and providing medical information, pharmacy students need to be supervised by pharmacist preceptors who are certified by the State Board of Texas. Project Collaborate screening events are held throughout the academic year, generally from August until May. Volunteers are asked to precept for at least one screening event per year. If you are interested, please email Susan Brown or phone her at (512) 475-9758. Your name will be added to a list of alumni who are interested in volunteering with Project Collaborate. We hope you will volunteer. Please email Susan Brown with any questions or to sign up.